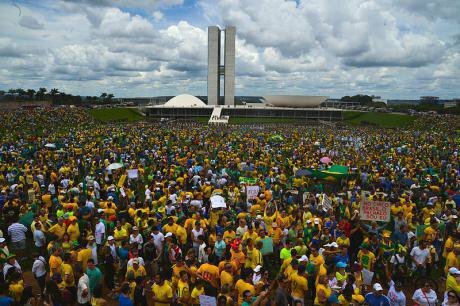 Protest against the government and corruption in Brasilia, on the 15th March 2015. Image: José Cruz / Agencia Brasil, CC BY-2.0. All Rights Reserved. All alarms have gone off in Latin America’s democracies. Bolsonaro's triumph in Brazil is the consolidation of an emerging global trend which uses social aversion to politics to establish authoritarian and often openly anti-democratic alternatives. This is now an established trend in North Atlantic countries and it is slowly but decidedly growing in our countries both on the right, like in Duque's Colombia, and on the left, like Ortega's Nicaragua and Maduro's Venezuela. It is no longer just apathy, ideological dogmatic fatigue, or the crisis of political parties. It is rather the positioning of fear and hatred as a means for concentrating power and exploiting voters, and the use of force to do away with political alternatives. Given this new scenario, democratic forces must realign their plan of action, reshape their strategies and redirect their tools. When Larry Diamond was warning us three years ago about the democratic recession that Western countries were experiencing, we said he was wrong. We agreed on the symptoms, but we did not share his diagnosis. In the context of growing political instability, very low levels of legitimacy of representative institutions and massive social protests, what we saw was the emergence of a constellation of democratizing movements which clashed with traditional politics. Especially in countries with progressive Pink Tide governments, we saw that discontent focused on the exhaustion of traditional politics, particularly on the growing contradictions that these governments deepened extractivism, allowed outrageous levels of corruption and behaved intolerantly with dissent. In surveys and focus groups which we conducted then, we found that activists were claiming democratic advances, an expansion of rights of vulnerable social groups, growing participation of women in politics, and greater social inclusion. The scenario today is quite different. The year 2016 marks a new era where anti-politics is consolidated and antidemocratic authoritarianism creeps its way in. Their demands focused on the "way" in which traditional politics exercised power. We criticized then that the main intellectual currents did not account for an emerging political phenomenon which we called "political innovation". These movements, closely related to the use of digital technologies, emerged in the last 10 years and proposed practices, principles and organizational methods as opposed to political party-based representative politics. The Chilean Penguins, the Mexican #yosoy132, the Argentine #niunamenos, the Brazilian #vemprarua were essentially democratic movements which (despite their respective peculiarities) had in common the inclusion of non-traditional actors, the defense of open practices, horizontal structures and distributed communication and action schemes. Moreover, we were excited to witness in those years how some of these movements grew and became electoral alternatives, as in the case of Democratic Revolution in Chile, Wikipolitica in Mexico, or Muitas in Brazil. We understood that this was going in the right direction and that, to the extent that these experiences actually multiplied, we would be able to qualitatively transform the region’s democracies. It is the year in which Donald Trump gets elected president of the United States, it is the year of Brexit and, closer to us, it is the year of the defeat of the plebiscite for peace in Colombia, the soft coup against Dilma Rousseff in Brazil, and the year in which Maduro decided to dissolve the elected Congress and thereby to throw overboard the last remnant of democracy which was left in Venezuela. Two years later, with the election of Bolsonaro as president of the largest country in the region, a new political paradigm is consolidated, where politics has practically lost its mediation capacity before authoritarian forces, where antidemocratic authoritarianism has lost its shame, and where the decision to participate in politics has become a life-threatening option. Digital technology, which we thought was the main ally of political innovation, because of its potential to democratize the debate, distribute leadership, open-up governance and make processes transparent, bears a strong resemblance to some of the bloodiest episodes of Black Mirror, having transformed itself into one of the main instruments of control, oppression and manipulation of the majority in the hands of the powerful. This new scenario manifests itself mainly through three perverse mechanisms: the use of direct violence as a deterrent to activism, the strengthening of a vigilant State, and the control of the narrative for the purpose of exclusion and hatred. Violence is the voice with which authoritarianism drowns democratic debate. The attacks on human rights advocates, social leaders and the free press have reached a historical peak. In 2017, at least 312 human rights advocates were murdered in the region. The vast majority of cases were registered in 3 countries: Colombia, Mexico and Brazil. The independent press, on the other hand, is constantly harassed – so much so that according to Freedom House it currently finds itself in its worst situation over the last 13 years. In the past year, 11 reporters were killed in Mexico; in October 2018 that figure had already been exceeded. During 2016, Artículo 19 recorded 426 attacks against the press, a 7% increase from the previous year. The increase in attacks against female journalists in particular stands out: they rose 15% from 2015 to 2016 - 96 cases in total, 14 of them explicitly for being women. Social protest has also once again become a crime. Governments regulate public space, declare states of siege to justify repression and persecution, and annul the right to organise and express opinions. In Venezuela, the Government has come up with a Law against Hate, which allows censorship and the persecution of media, journalists and activists for the content they publish on the Internet. In Mexico, a Security Law was passed which allows the use of security forces in public security matters, raising the alert against potential abuses, considering recent findings in relation to the disappearance of the Ayotzinapa students (Frontline Defenders, 2018). In Nicaragua, the requirement of a permit for using public spaces has been decreed, which allowed the arrest of 30 people during a march in early October. The States of the region are increasingly functioning according to the interests of powers such as transnational corporations, illegal trafficking, and the mainstream concentrated media. They focus less on guaranteeing rights and providing social policies, and more on monitoring and control. Argentina, for example, is currently shaken by a deep economic crisis and has eliminated this year several ministries (such as Health, Labour and Science and Technology) in its determination to deepen public spending cuts (which are expected to increase in 2019). Despite the adjustment in key social sectors, the national government has nevertheless increased the responsibilities of the Armed Forces and their corresponding budget allowance to enable their intervention in internal security matters. Similarly, we are witnessing an alarming tendency to use the Judicial Power to discipline political voices. This judicialisation of politics - Lawfare in English - operates suspiciously in tune with both the mainstream concentrated media and the social media to create a mood opposed to certain political tendencies. An emblematic case is the imprisonment of the most popular political figure in Brazil, Lula da Silva, six months before the presidential elections. Although governments’ tendency to access information on their citizens is nothing new, the possibilities of doing so on a massive scale certainly are more apparent. Surveillance technology is becoming cheaper and more readily available, as well as the ways in which citizens expose themselves due to lack of awareness or knowledge (Freedom House, 2017). The hacking of the Italian firm HackingTeam unveiled the purchase of its surveillance software (Galileo, Davinci and Remote Control System) by several governments in Latin America, including those of Brazil, Chile, Colombia, Ecuador, Honduras, Panama and Mexico, and ongoing negotiations with several others. Pegasus, the surveillance software for mobile devices developed by the NSO group, was also recently detected in Mexico and Brazil. This latter software allows the spoofing and control of media accounts. Surveillance is not only facilitated by technological advances, but also by more permissive legislation. In Mexico, a law was passed that allows expanded legal capacity to carry out surveillance measures. Surveillance is not only facilitated by technological advances, but also by more permissive legislation. In Mexico, a law was passed that allows expanded legal capacity to carry out surveillance measures, for example by establishing the obligation for telecommunication service operators to keep their users' metadata for a period of 24 months, or authorizing their geo-localization in real time. Surrounded by political apathy, the regression of social advances, increasing unemployment and the massive arrival of Venezuelan migrants - who have become scapegoats of the far-right governments -, the region has become a breeding ground for political expressions bent on exploiting these frustrations. They do so through messages of hatred, exclusion and the recovery of values considered to be of a higher order, such as the fatherland, religion and the family. Technology plays an important role here, especially through the use of the data industry. According to Tactical Tech, some 40 methods have been detected by which political organizations and governments can use digital technologies to generate distortions in public opinion. These methods include, among others, the micro segmentation of profiles through Facebook data and other social media services, fake news, troll and bot farms, and the massive use of WhatsApp groups. The problem with these methods is not only an ethical question, since they involve manipulation and the violation of the right to privacy, but their instrumental use to promote hatred and violence towards others. There is sufficient evidence showing that these mechanisms were used by far-right, xenophobic and anti-human rights organizations during the last presidential campaign in the United States, the Brexit referendum, the plebiscite for peace in Colombia and the last elections in Brazil. Candidate Jair Bolsonaro, for example, ran most of his campaign through WhatsApp groups where he planted a huge amount of false information on his opponents. In the same vein, political organizations are currently channeling verbal violence directed towards certain social groups to discredit them and promote hatred against them. Direct censorship is the most damaging method of narrative control. Governments possess the technology to interfere and block contents and avoid both access to information and communication between citizens. There is evidence of censorship of the media in Venezuela and Nicaragua, but also in countries with democracies which are not in crisis, such as Chile, through restrictions on the use of services such as instant messaging by activists. However, this is only one form of censorship. The large media monopolies, as denounced by several Latin American organizations, are accusing independent media of being “fake news” so as to promote actions against them and silence them. New times require new remedies. With the election of Bolsonaro, and the consolidation of the new paradigm, political action needs new strategies and perspectives focusing on democratic resilience. Strategies paying particular attention to open access to information, co-creation and participation mechanisms, and transparency have now become insufficient initiatives which only go halfway and do not solve the underlying problems of this new scenario. The first strategy must be embracing knowledge and the defense of the fundamental rights. Before a vigilant State and its repressive practices, we must improve the defense channels in judicial processes, the capacity to generate campaigns in defense of fundamental rights, the strengthening of international networks, and making better use of the existing international human rights protection instruments. However, it is necessary that we raise awareness of legal matters and socialize litigation strategies with the majority of the population, making the concept of "the law" accessible through "strategic litigation" forms, so that they can be spread from grassroots movements, street activists and public debate. In the face of violence, we must develop security tactics (analog and digital) and decrease the risks for public figures. The security perspective must be complete, including mobility, communication, information protection and even psycho-emotional aspects. Likewise, we must regain our initiative regarding the narrative. We must recover a message through which democratic processes can reconnect with the majority and respond to their needs, and not feel frustrated because they do not. And as far as the media is concerned, we must understand communication channels better and create incentives for the creation of a responsible and professionalized media. Nothing will be possible, however, if we do not recover politics, especially the legitimacy of political parties and institutions. Without them, there will not be any possible containing the advancing tide.